Forget that boring old fire pit, build a Flame Tree instead! Maker Faire is a great event to attend not only because you get to see all sorts of cool designs and machinations, but because you can participate as well. 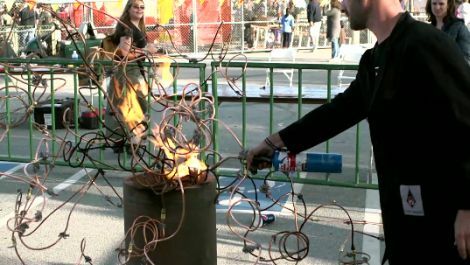 At Maker Faire Bay Area 2011, maker [Brett Levine] put together a fun and interactive display he likes to call the DIY Flame Tree. The concept is pretty simple, and he says everyone who participated got a pretty good kick out of lending a hand. Each participant was given a piece of copper tubing and allowed to bend, twist, and sculpt it to their liking before using a drill to add holes wherever they pleased. They were then allowed to choose where their portion of the project would be mounted on the existing tree. With everyone standing a safe distance away from the display, [Brett] pumped it full of propane and lit the various sections on fire. In the video below, you can see that the display was blown around a bit by the wind, but we imagine it would look pretty awesome on a still summer evening. Even if you’re not into this sort of art, you have to admit that it certainly beats a boring old fire pit! *Also* This guy is a douchebag in the above comment. A write up on this would be great! I wonder what size holes / fittings he is using. Skip around past artsy pans of pipes. Finally get to poor 10 sec video of the piece being lit. Still haven’t even seen the whole piece in one frame. Noticed 20+ seconds of non content at end of video. post for 30 sec on hackaday describing my displeasure with the makerfair TV clips. As do I. An identical experience. Sorry, but I’m unimpressed. Maybe on a calm day it would look great. Perhaps they need to be using an easily adjustable regulator to adjust the gas flow for ever changing conditions. It probably didn’t need the fifteen second credits at the end, and yeah had they demonstrated this at night when it wasn’t windy the effect might have looked more interesting than random fire coming out of a tangled mess of metal. Hint to people making videos – flames in daylight look boring, and if you’re an artist stop talking about whatever you think is important, we don’t care – your art should speak for itself. The Rubens Tube video is >> make video. It would be phenomenal to see that kind of effect for a full spectrum instead of just the bass line. Didn’t even have to listen to anything about some home cooked meals either. This is kinda dumb to me, Plus copper isn’t real cheap. Meh I had better results with filling a syringe with liquid butane, then lighting a flame from the needing, and finally modulating the flame size using the warmth of my hand.